‘Gold in them thar hills’? Though not on the scale of California, in 1795 Wicklow witnessed a gold rush on the Goldmine River that flows northwards from Croghan and the Moneyteige mountains. Tradition says a local school teacher named Donaghoo began living beyond his means, arousing suspicion. He had noticed a stream glistening in the rays of the setting sun and realising this was gold, began secretly panning the sands for flakes and nuggets which he subsequently sold to Dublin jewellers for cash. Sadly for him, he fell in love with a duplicitous local girl who tricked him into revealing the secret of his wealth. The news ran like wild fire! People flocked to the townlands of Ballinvally and Ballinasilloge, panning the sands of the rivers and streams below Croghan and Moneyteige, carting away clay to washings. By October 1875 up to 80 kg of gold had been recovered. Unsurprisingly, this activity attracted the attention of the authorities and a party of the Kildare Militia took possession of the workings on behalf of the government. The small barracks that they built and occupied in the valley are still extant. An Act of Parliament to legalise the operation received Royal Assent in 1797 and 2 months later the first ingot of gold was sold to the Bank of Ireland. Another 17 kg of gold was recovered before operations were disrupted by the Rebellion. The labour force joined the rebels and the workings were ransacked. Work resumed in 1800 with attempts to discover the gold bearing ‘mother lode’. 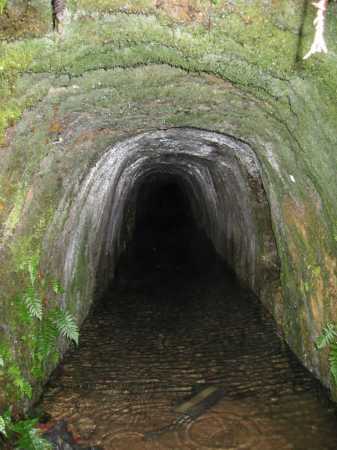 Numerous trenches were excavated to bedrock and an adit (tunnel) was driven near Ballinvally. None of the quartz veins contained any gold and the operation ceased. Gold continued to be recovered intermittently by various companies, including a London based one overseen by a Cornish miner in 1840. About 60 people were employed, but returns were just enough to cover expenses and the operation folded after a few years. Locals however, continued profitably working the river and its tributaries, as well as the Aughrim, Coolbawn and Avoca. The Goldmine River workings are estimated to have yielded in total some 300 kg of gold, which, based on C19th gold prices, would be about £30,000. Today this would equate to a staggering $13-15 million. Some large nuggets found in the gold rush were sent to the National Museum, Ireland.